If only there was a veggie garden expert hotline. All is not bliss any longer at Hoe & Shovel. This first-time veggie gardener is in need of some serious advice. We're having some issues with our small plot of veggies. All of a sudden we've got bugs and worms out the wazoo. We have been determined to do this organically--- using no pesticides---- which we've managed to do so far. There are oodles of tomatoes on the plants --- that's not the problem. Seemingly overnight there are also oodles of these green creepy crawleys --- common aphids I assume. A closer look at their frolicking on the lush greenery provided. An interesting observation: there is one lone tomato plant I put in a container (as sort of my own little experiment) that stands about 8 feet away from all the other tomato plants. It does not have any problems as of this moment. The squash and zucchini have worms... I am at a complete loss as to how to combat that evil force but they are taking over. The green beans, peppers, leeks, and pole beans seem to be unaffected by all the other disasters going on in the next bed. What's up with the splitting tops on the tomatoes? The taste is unaffected and it doesn't cut completely through to the flesh but it surely is ugly.... besides that it just isn't right. Any veterans out there have some advice... or at this point even a guess would help? Yikeszers. I'm sorry to hear about your woes. I didn't know about the worms. Ick. I will keep checking back to see if anyone can help with the problems. Best of luck! How's about my homemade remedy of hot pepper sauce mixed with garlic juice and dishwashing liquid soap? Sounds delicious I know, but bugs don't like it. 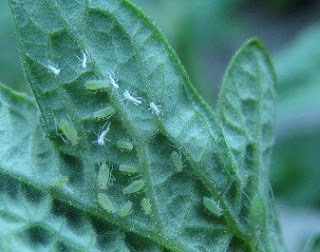 On the aphids, spray them off with water, or use an insecticidal soap. You won't kill all of them, but if the plants are otherwise healthy, they can withstand some aphids. The "worms" on the squash and zucchini are probably squash vine borers. Nasty critters, they bore into the stem and then that stem usually dies. Google this one, but I think for the few plants you have, if you see where they bored into the stem, you can slit it at at that point with a sharp knife and then dig out and kill the borer. I know, it's gross. Then cover that part of the stem in the ground, and it might root at that point. On the tomatoes, cracking like that can be caused by variations in soil moisture when the fruit ripens or high temperatures, I think. It isn't pretty, but the tomatoes are still edible, they just won't store as long. 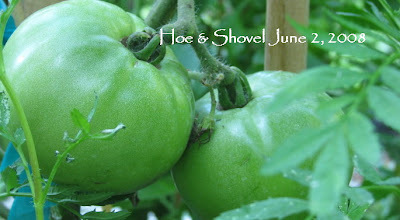 Have you seen any tomato hornworms yet? Don't give up! The veggies are worth these "little troubles". The only think I might be able to help with at all are the tomatoes splitting -- this is almost always caused by irregular watering. When tomatoes are setting out fruit, they should be generously watered, morning and night if possible. Even after a soaking rain, they will need to be watered. This is the only thing I know of that causes such splits. As Carol pointed out, they're still usable, but won't keep as long. Sigh, I am sighing with you! I absolutely hate aphids...they give me the creeps. I hose them off....and go on daily water spraying until they seem to disappear! I recently read that inviting lacewings into the garden helps....so plant Alyssum and daisy like plants nearby! We use a neem oil spray for the aphids (also excellent anti-fungal). For the squash, it could also be pickleworms, they do love the cucurbits. The only thing that works on them is sevin, preferrably in solution, spray undersides of leaves, fruit, everything. Not organic, no, but whatyagonnado. We live in Florida. 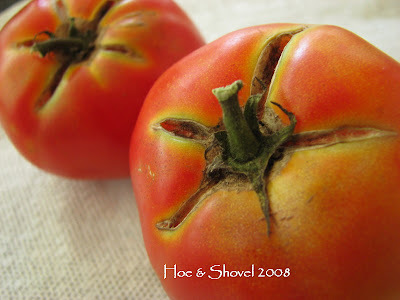 Oh, and the tomato cracking can also be due to overwatering. This is why we leave the gardens alone from June to mid August. Too many bugs, too much humidity, everything is going to wilt, get fungus, get eaten. Hi Meems...whenever I have aphids on anything I just jet spray them with the hose. It takes several goes generally but I have found it successful. The cracks in the tomato I believe is something to do with the watering. I found only water them when they are really dry. As for the worms.....I really don,t know. I will say that the first year of veggie growing is the hardest, it does get easier....honest! I feel your pain - last week I was so jealous of your beautiful vegetables (because mine is usually not that beautiful - my tomatoes split or are splotchy - my green beans are shared with the worms - and my squash gets end rot or the worms or fungus ruin the vines. Just remember that organic produce is often not as pretty as commercially grown - but that doesn't mean it's not tastey! My tomatoes split when it gets really hot around here (95 and up) - but I'm an irregular waterer so everyone's water theory is probably right on - I just take the splits as something to deal with. My spring tomatoes (planted in September or October) don't get those splits. When I have to fight worms, I usually just try to find them and squish them. My biggest problem in the vegetable garden lately has been rabbits! They ate every bit of spinach last spring . . . Where's Mr. McGregor when I need him? Vegetable gardening seems to be a years-long learning process, doesn't it? Thank goodness for that added "edge" of more experienced garden bloggers! My attempts last year were a complete flop due to various molds and mildews, a late start, and my total lack of experience. You might want to have a look at www.urbanhomestead.org/journal. The Dervaes family grows almost all their food and sells some too and they do it all organically. There are tons of jewels in their blog - I've been reading it for almost two years. So sorry about the pests Meems. I didn't have much trouble with aphids, but when they did show up, the hose method definitely worked. I hope the other suggestions you've gotten will help as well. It sounds like hot weather must be setting in earnestly in your neck of the woods - the pests and the tomatoes splitting, whatever the cures might be, do seem to be more of a problem when the weather turns hot and humid. Thanks everyone for your earnest comments and help. Seems whatever worm got my squash has also gotten my hardrive... which FAILED last night in the middle of night. Black screen, with the message Disk Failure something or other. Anyway... with no extra computers in the house these days.... it will be scant blogging for me for a while... I'm borrowing a family member's internet service tonight. Carolyn Gail: Sounds yummy and like it would keep the rabbits (cats, and squirrels) away too- which I don't have but some other folks might want to give it a go. Carol: I'm not too discouraged as we have had some great fruit so far. I was warned by other "Florida" growers how short our growing season is due to heat. I don't think the worms on the squash are bothering the stems... they are only boring perfect tiny holes in the fruit itself and when cut at the hole... the worm is harbored there inside. Good idea to call my cooperative extension office... I keep forgetting about their services. 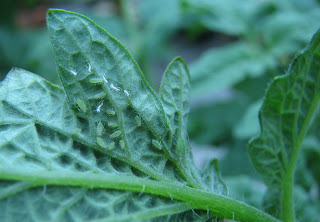 No hornworms on the tomatoes (so far) only the aphids on the underside of the leaves. The tomatoes have been plentiful and wonderful... which is why I am desperately trying to keep them growing for as long as possible. Thanks for the help and the encouragement. Nancy: Thank you. After reading over everyone's comments it is hard to know if I am under, over, or just right watering. I can tell you I faithfully soak the beds every morning. I don't water twice a day which maybe I should be doing but I don't really know. Gail: Thanks for the sighs... it helps to have more sighing than just me alone ...believe me. :-)Surprisingly I don't have a problem with aphids in my "other" garden... I have seen a load of lady bugs around this spring... maybe they are doing their duty well. Stacy: you aren't the only "Florida" gardener that has suggested sevin... AND concede there isn't a whole lot of choice once it gets this hot and humid. I may have waited too late but I think you're right about the pickleworms... perfect little holes and the sticky goo. Soooo... is it over or under watering? How can I be sure? cinnamonbite: hmmmm... you might have a point there! Thanks for stopping by BTW. jane: thanks for your well wishes... I know you are routing for me and my veggies... that helps. Cheryl: Thanks for your suggestions... I am counting on veggie gardening again in the fall... one of the benefits of the heat... we get to have two growing seasons. Maybe it will be easier the next go round. Actually until this week it has been "too easy". I knew that would be short lived. ha. Mary Beth: The green beans & pole beans are bug-free so far... whew! I've heard that once the soil gets to a certain temp (not sure what it is) that we can hang up our veggie gardening hat here in Florida... everything just poops out. We'll see how true it is here in another week or so with current temps in the high 70's even at night. Amy: Yes, a complete learning process... but worth the challenge. I will check out the site you mentioned... always enjoy hearing tips from experienced folk. I sure hope you are feeling better! Linda: Heat and humidity are the name of the game now. Vegetables don't much like the high temps but the bugs come out in force. We'll keep plugging along and see how it goes the next week or so... we might be close to the end of the harvest for now. Thanks for your help. Underwatering makes the leaves/stems shrivel...you will see actual drooping when they are underwatered. Overwatering causes a host of problems, but the biggest indicator is split fruit. The fruit gets all excited, has a growth spurt and splits. Just keep the watering consistent, same amount every day, same time every day. Obviously when the rainy season starts we're at the mercy of the clouds, but until then you can control how much water they get. Here comes my speech on natural soap insect spray. I preach it. I did have it up at my old site--but you know--I'm still catching up there. Ok...take two tablespoons of grated up ivory soap--has to be ivory soap. 1 Quart warm water. Mix the two. Put it in a spray bottle. Spray a small area that is infected with those varmits both worm and aphids. The bugs are going to die cause the soap will eath through their skin. I just want to make sure we didn't put in too much soap for the plant. As long as that part of the plant lives---then we didn't make it too strong. The bug dies and you spray the rest of those varmits. It works for me and I even make a stronger batch when the jap beetles start eating my crepe myrtles. If it was too much soap then just back down to 1 tablespoon. My tender plants can only take one tablespoon of the soap solution. There is a difference in soap and detergent. Most of your kitchen sink dishwasing liquids are detergents. Detergents will give you clean bugs but won't kill them. You need good old soap. Good old soap will eat right through the toughest of skin on any bug. pooey about the pesky critters you're dealing with. we used to get aphids on our container ivy but i would spray them with a mixture of dawn and water and they would go away. also you can import ladybugs. i guess my happy days are numbered, too! it has been fairly easy so far. my biggest problem has been weeds. we didn't kill all the undergrowth so after this harvest i am going to do something about that. I cannot help you Meems. It sounds like you have had some excellent suggestions already. I hope it all works out for you. I do know that not all veggies are picture perfect but can taste great just the same. Hey Meems, you have found out the inevitable fact that bugs and vegetables just go together....I wouldn't worry too much about the aphids. It looks like your plants are far enough along to survive and do ok. If there were perennials or shrubs my suggestion would be different but the seasonal vegies at this stage I'd just wash them off. The home made remedies listed here sound like they could be worth a try. If you absolutely must kill them you can order ladybugs online and it is actually surprising what a good job they do. Now if you had the big hornworm caterpillars well that’s a different story. I can tell you several fun (morbid) things to do to them buggers. stacy: It is kind of difficult to pinpoint if I am overwatering except the sign of the splitting. I faithfully water each morning soaking the raised beds. Typically they dry out by night time and then they get drenched again in the morning. Thanks for the tips on watering. Anna: I remember that post on soap insecticide but I forgot about shaving the bar of ivory... I'll give that a try in the future. thanks for the preaching. Marmee: Pesky creatures indeed. It has been a battle but with all the help from folks it is feeling manageable. Weeds haven't taken over yet I guess because I started with imported soil. Lisa: You are right about veggies tasting wonderful even though not picture perfect... thank goodness. Rees: I'm glad you mentioned not to worry too much about the aphids. I have been hosing them off but not feeling as threatened by them. This was a thought provoking statement---keep them rather dry and even stress them a bit... I'm wondering if you meant to let them stay dry or just to let them dry out in between watering? If I can figure out the watering that best suits my garden I will feel like I have mastered a majore victory. Thanks for the help!